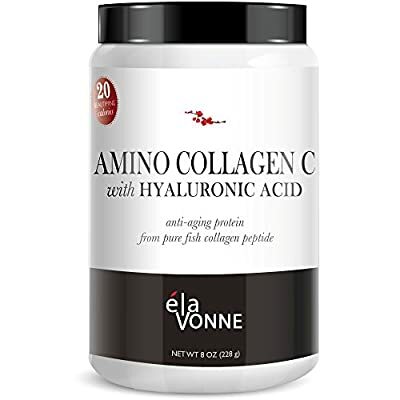 Amino Collagen C with Hyaluronic Acid powder mix (30 Day Supply 228g) — Pure Collagen Powder Flavorless Drink Mix from Fish Anti-Aging Protein to Improve Skin and Nails with GUARANTEED RESULTS. YOUTHFUL SKIN FROM THE INSIDE OUT. - Is your hair, nails, and skin starting to show your age? For years, beautiful women overseas have realized the benefits of amino collagen supplements from fish peptide collagen. They experience firmer skin, better hydration, and strong hair and nails. 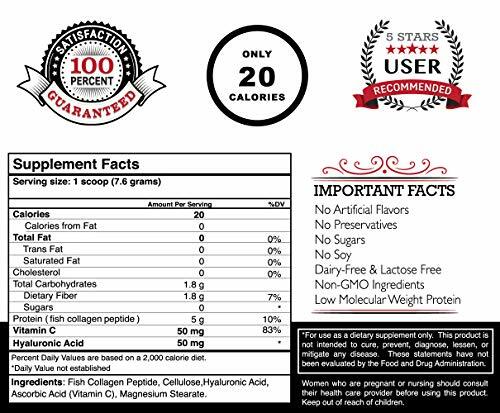 FISH PEPTIDE COLLAGEN PROTEIN - 5,000mg of pure fish peptide collagen protein per serving. Because of its low \"molecular weight\" it is is easily absorbed in the body and more beneficial than other sources of collagen. Amazing support for your skin as well and hair and nails. HYALURONIC ACID - Hyaluronic acid (HA) from a vegan source. HA has numerous benefits in the body. 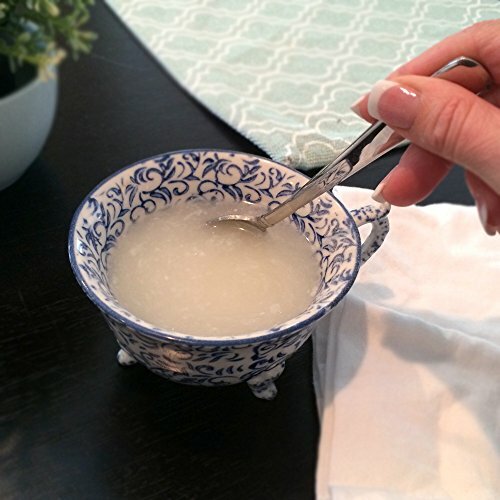 For the skin, it acts as a moisture binder and improves skin texture, hydration, and stimulates collagen synthesis. VITAMIN C - Vitamin C will help increase collagen production in the skin. The result serves to reduce wrinkles and fine lines, and improve skin immunity. COMPARE ELAVONNE'S Amino Collagen C with Neocell or Meiji for great value and ingredients. No added chemicals, amino acids, sugars, or flavors. Just pure ingredients Made in the USA. SEE RAPID RESULTS with continued use. 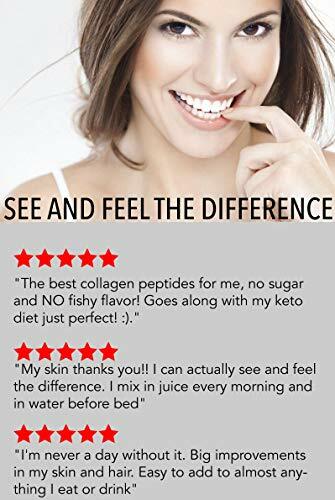 REJUVENATE yourself with a CLINICALLY TESTED solution for AGELESS SKIN IN 12 WEEKS - The best type of collagen powder for beauty is pure "Type 1" fish collagen peptide powder. This anti aging protein formula brings your body collagen levels up to make you look and feel younger. Fish from fresh water is contaminant-free and clinically proven to work better than ANY other type of collagen from ANY other source. 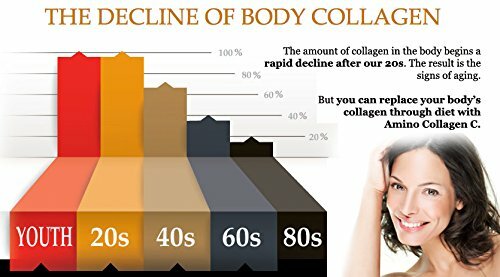 Collagen supplements for skin. IMPROVES SKIN FIRMNESS - Increase smoothness and moisture retention in skin with continued supplementation. Hyaluronic acid works from the inside out to hydrate and retain moisture all over your body. Vitamin C keeps your collagen production working and sustained in your skin, hair, and nails. A TRUSTED FORMULA - Sugar Free, Unflavored Collagen Supplement, No Fillers, No Flavors, No Preservatives, Sugar Free, Hormone Free, Arginine Free. This collagen supplement is made to work quickly in your body, it's absorbed and used fast to give you the results your WANT! YOU'LL FEEL CONFIDENT - Knowing that with each day you're preventing deep wrinkles, firming your skin from the inside out, while increasing hair and nail quality as well. 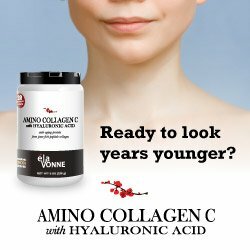 Replacing the collagen you had from your youth every day with Amino Collagen C. YOU'LL FEEL SECURE - Made in USA. Money Back Guarantee. SHIPS IN 24 HOURS (no weekends). Certified Halal and Manufactured in a GMP certified facility.